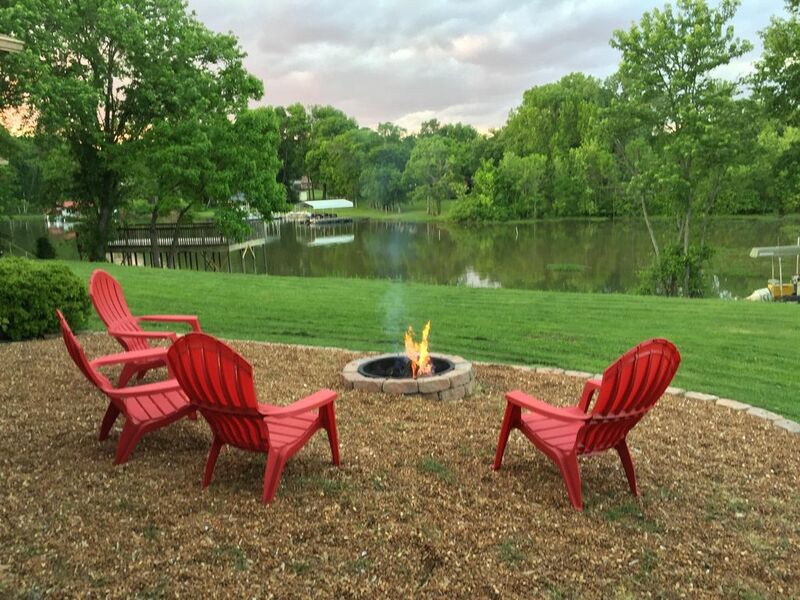 Relax for a couple days on the lake or sightseeing around Nashville with family or friends. The central location in middle Tennessee/Nashville area makes it perfect place to "meet in the middle" to catch up with friends and family. This beautiful lake home is a quiet retreat, yet near Nashville. Located on Two foot cove on Old Hickory Lake and a 30 minute drive to most Nashville sightseeing. The house was been recently updated and decorated. Fully furnished lake home with 4 bedrooms, 1 nursery/study, 2 bathrooms, and sleeps up to 12. Great open floor plan that can be combined with large screened porch though sliding glass door really connect the indoor space with outdoor beauty of the lake from the screened porch. Whether you rent a boat, bring your own boat or just enjoy the wildlife while relaxing, your stay will be unforgettable. Enjoy the 32' x 16' boat dock. Less than 4 miles away is a nice sand beach on the lake at Cedar Creek Campground park, which is great for swimming and playing in the sand with family. For Boaters: The water depth at the dock averages 18 to 24 inches based on Army Corp of Engineer water management at Old Hickory Dam. The cove bottom is a soft mud. Pontoon, Bass, and small ski boats can assess Old Hickory Lake and the Cumberland river from dock. Dredged channel (approximately 200 yards) in the end portion of cove is indicated with pvc pipes in water to allow access to dock. The house is close to attractions such as The Hermitage (home of President Andrew Jackson), The Opry House, The New Providence Shopping Center, and 25-30 minutes to downtown Nashville. Commuter rail service (Music City Star from Mt Juliet or Hermitage stations) offers easy access to downtown. The house is fairly accessible with one step into the house, and all other rooms are on one level (except garage). Detached garage not included in rental. Our insurance company requires us to include the following waiver. Upon booking our property you are agreeing to the terms of this waiver. In consideration of being permitted to utilize a lake home for short term stay (the “Premises”), including participation in use of Old Hickory Lake which are activities located in the backyard of the Premises, conducted by the RELEASORS, their CHILDREN, and their invitees, RELEASORS hereby release, waive, and discharge BRYAN & CAROLYN MOORE, from all liability to the RELEASORS, their CHILDREN, and invitees, legal representatives and assigns, for any and all loss or damages, and any claim or damages resulting there from, on account of injury to RELEASORS, RELEASORS' CHILDREN, and their invitees, person or property, even injury resulting in death of the RELEASORS, RELEASORS' CHILDREN, and invitees, whether caused by the negligence of Bryan & Carolyn Moore or otherwise while participating in lake related activities. RELEASORS agree to indemnity and hold BRYAN & CAROLYN MOORE harmless from any loss, liability, damage, or cost they may incur due to the presence of RELEASORS, their CHILDREN, and/or their invitees, in or upon the Premises or on Old Hickory Lake whether caused by the negligence of BRYAN & CAROLYN MOORE or otherwise. RELEASORS hereby assume full responsibility for the risk of bodily injury to RELEASORS, their CHILDREN, and their invitees, death or property damage due to the negligence of BRYAN & CAROLYN MOORE or otherwise while in or upon the Premises and while participating in activities on Old Hickory Lake. RELEASORS expressly agree that this release, waiver, and indemnity agreement is intended to be as broad and as inclusive as permitted by the laws of the State of Tennessee, and that if any portion thereof is held invalid, it is agreed that the balance shall, notwithstanding, continue in full legal force and effect. My wife and I recently moved back to Nashville, and we wanted to be able to enjoy the living on the lake. It is a great place to relax, and its great to be able to share the experience with visitors. It is a great blend of life on the lake with the convenience and fun of being near Nashville with all its fun and glamour. Indoor and Outdoor Living combined with a view of the water. With the large screened in porch with fan, you can enjoy the outdoor space while inside. The fire pit area connects the screened porch area to the private study balcony. The house is located on Old Hickory lake on the Cumberland river. You could take a trip to downtown Nashville and spend the day visiting lower Broadway and make it back in the same day. Enjoy relaxing beside the water on the house's dock on Old Hickory Lake. House had dock with direct access to Old HIckory lake. with several detergent pods provided. 1 garage parking spot if needed in other bay across from pool table. basic spices, coffee, All items in cabinets are available to use. The dining room table has six chairs. The table does have an internal leaf to expand if needed. The screened porch table has 6 chairs. A folding table and 4 additional chairs are in front closet. Monopoly, playing cards, and battle of sexes available at house. Amazon Prime and Netflix movie collections available through streaming service on TV. Canoe with 2 paddles and 3 personal flotation devices. Available April thru October. We have a 3 person tow-able inflatable, raft, and kids inflatable at the house to play with in the lake as well as a canoe at the dock. For elderly guest. The main house is all on one level. There is one step down on the sidewalk and on step up to the front door of house for easy access. Entrances at rear of house have 3 to 4 steps. Access to the dock requires 10+ steps or can be accessed by walking through grass down gentler slope at the right side of the yard. Robin A.Where do you live? Our extended family of 10 from Wisconsin stayed at Bryan's rental over Easter. The house included everything we needed to feel like we were in our own home. The open floor layout kept all 10 of us together without feeling like we were in each others way. We brought our boat and when the weather finally allowed were able to launch it from the local boat launch just down the road and dock it at the house during our stay. Super convenient. Bryan was very quick to respond! Thanks Bryan for the use of your wonderful home and location! We stayed at Splashing Turtle for 3 nights with another family for the first half of spring break. Wanted to be near Nashville but not stuck in a hotel. House did not disappoint. Very clean, lots of room, comfy furniture and beds, huge screened porch. Kids enjoyed watching the turtles and even caught a fish out back. Owner was responsive and helpful. Only downside is we did a lot of activities south of nashville in Franklin and Brentwood areas and that required a solid 45-60 minute drive every day... but at a fraction of the cost per night so worth the drive. Kitchen was well stocked. Great waffle maker! Really nice! Big Kitchen and great location. Easy to get to Nashville and great for family. The kids had a fantastic time! Loved being on the river and having the canoe. House size was great for all of us. We had a party of 10 and 4 kids and had family over for dinner. Plenty of room to spread out. Loved the fire pit and kitchen size! Parking in the back was cool. We all loved the home and Tennessee . The kids did not want to go home. 😊� Thanks for the yummy waffle mix and maker. We would definitely recommend . I had a group of 10 adults and the house was great! Bryan was very responsive! A quick 30 min Uber to downtown Nashville! Highly recommend! The house was just as it looked in the pictures and fit all of our needs! We were impressed with the property. It was just how it looked in the pictures! Perfect area to stay far enough from the city but close enough to drive to Nashville and the Grand Ole Opry! We had an amazing time!